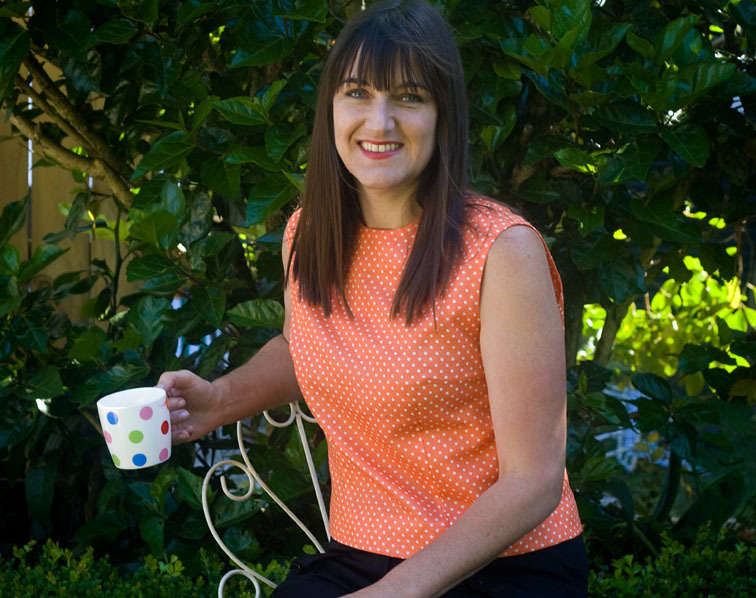 You might recognise the orange spot fabric from this post! It’s in that “new” shade of “Tangerine Tango” that according to Pantone is going to be in fashion next year…but quite frankly I thought it was in fashion last year. Well all the chain stores were full of it the summer before this one – I remember because I went shopping with my sister and tried some things on and that was when I decided I liked orange – the more intense the better! So either Pantone is a bit behind the times, or New Zealand is still catching up with the last time orange had it’s day! Either way I really don’t care or pay attention to these things, I wear whatever takes my fancy when I get up in the morning. And if you need cheering up, try orange! 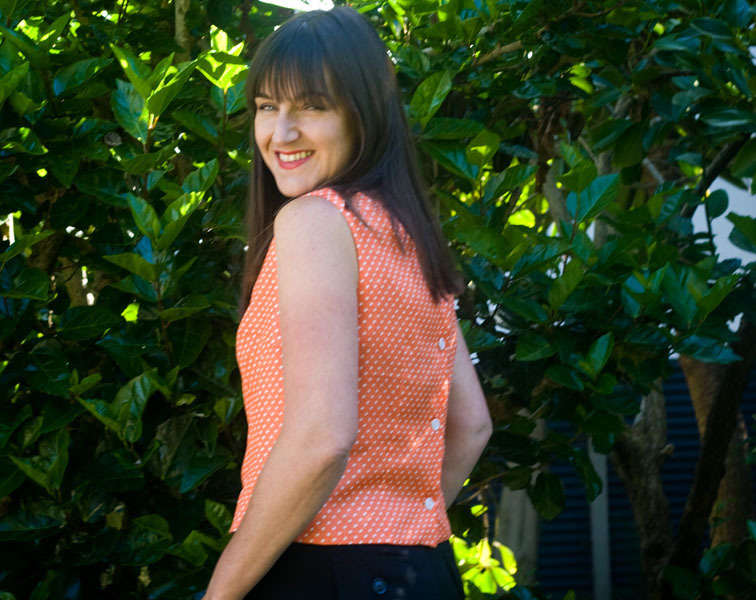 I used a pattern from 1964 – Simplicity 5441 – previously owned by Moire McCallum from 3H whatever that is. She had very kindly and neatly annotated all those perforations for me, so I knew which ones were straight grain and which were buttonholes – I would have rung and thanked her if the phone number had been current! This is it straight out of the packet. It is quite boxy, and my modern instinct is to take it in at the waistline, but my vintage instinct is to keep to the authentic 60’s silhouette – oh, what to do?! This fabric is a cotton voile, so I underlined it with Bemberg for opacity. I also turned under the edges of the facings as per the pattern instructions, a nice finish that I rarely use for fear of creating an impression on the outside, but the voile is lightweight enough to escape this. Do you like my lovely buttonholes? I haven’t told you about my new toy yet have I? Actually there are two toys…..but that is for another day! I love the 60s shape, the colour and the hem finish. This makes me dream of summer. It is a cold and wet January here in the UK! I love the colour and the fun dots. I'd be tempted to nip in the waist a little too, though I realise that the top is more genuine this way. Tagua really caught my attention. I haven't heard the word mentioned since I was a kid. These trees grew in the jungle where I lived as a kid. The “Indians” used to carve little figurines out of it. I was told that buttons used to be made out of it. I didn't know that they still were! Kind of neat. Adorable! 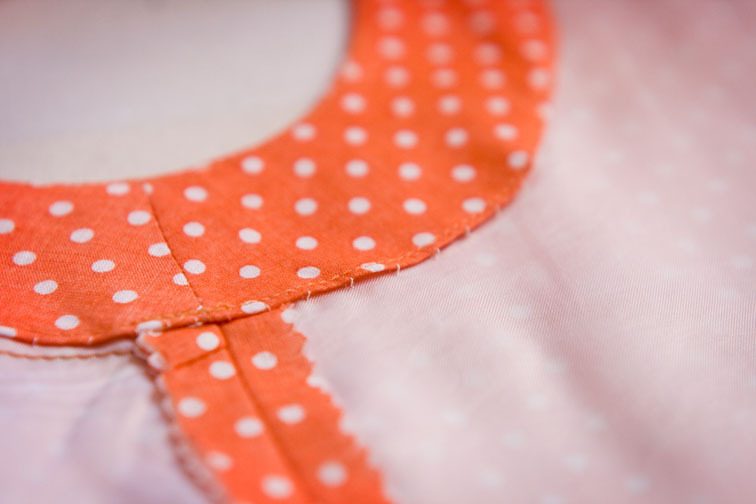 The colour, the polka dots and I love button-backs! I would keep the 60s shape, it's really nice. 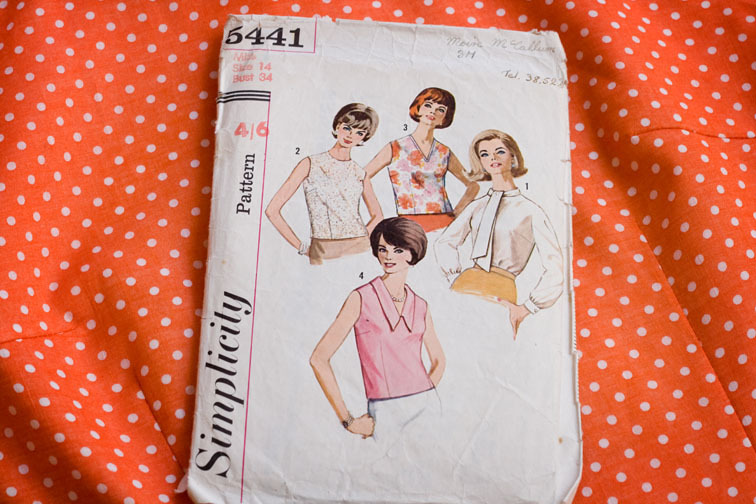 The version of the pattern with the pointy collar would be perfect for me… Oh, how I wish vintage pattern were more easily available here! I also thinhk that it would be nicer to nip in the waist. Yoy live now and not in the sixties. I do not remember that we wanted to be boxy or square in the sixties. I do certainly remember those rather short tops. This is so fresh and playful, I love it!!! Really sweet, and love the pattern and the polka dots are really fun and summery. Love the finishing touches like the lace too. I love orange also! I like the simplicity of this vintage top, but tell me, how do you do the buttons up when they are in the back? Orange is such a happy color! I love this. I have a button back blouse pattern from right around the same time that I tried to make up once but the bust darts were so high. I haven't gotten around to lowering them and trying again. I think you should definitely nip it in at the waist if you want to. I have no problem with being less than totally authentic. 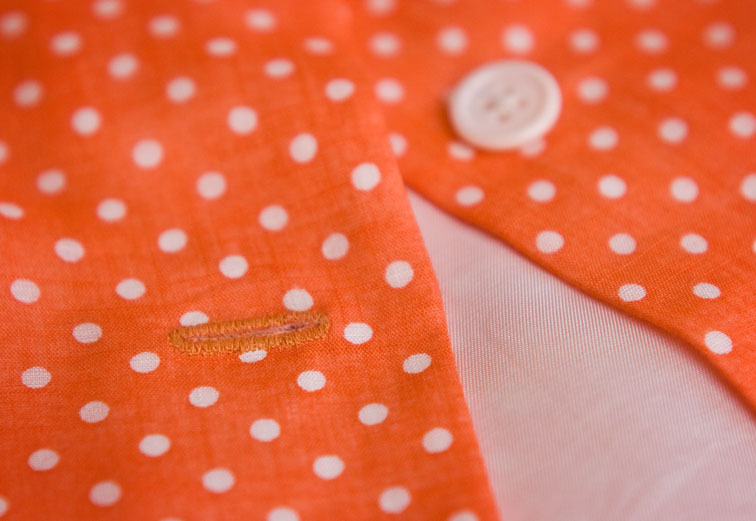 Also, those buttonholes are gorgeous! Ah, love your sweet and tangy tangerine top Sherry! 3H – could be a school class/or form number maybe? Have to say I love the collar on view 4. P.S. I reckon one of your new toys might be a vintage buttonholer attachment perhaps…..? Such a cutie! The color looks great on you. Love the top, it's so cute. I've actually been looking for that same pattern in my size, I love it! 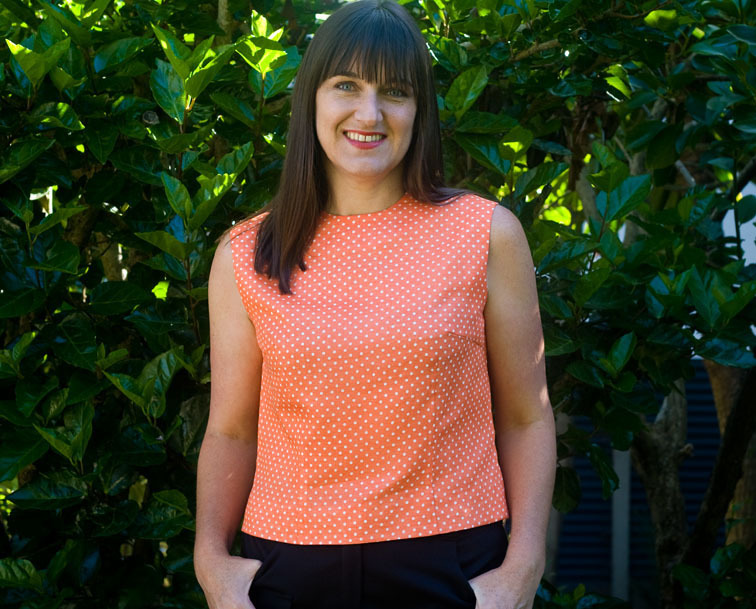 The blouse is lovely, I love anything with dots, tangerine tango or not. I also appreciate that you showed the interior finishing. Seeing how other sewists finish their work always teaches me something. I would leave the top boxy 60's style, because the hemline falls where it does, it defines the waist without tapering. Looks great on you! Wonderful work and a cute blouse. My son is usually the most obliging! Although I can undo them all, I can't actually do them all up! Yes! She may have been a student and made this for a school project! And yes to question 2! You are so right about orange – it's my favorite color and there WAS a trend last year. Pantone is behind the curve on this one. Great top! I was wondering the same thing! I'm too clumsy to button up the back myself! I love it! Beautifully finished as well. As soon as I saw the first buttonhole I thought – Aha, she's got a buttonholer! and I see from previous comments that you have. I just loooove the buttonholes my Greist makes. If '3H' is a class (which I would bet is the case) that means the girl was probably in the third form – can you see a 13 year old making this today? These days it's all pillows and elastic waisted pyjama pants! 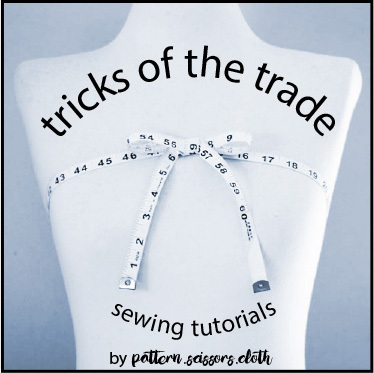 One last thought – if I made a top like this I'd put on the buttons and buttonholes because I like how they look, but I'd sneak an invisible zip down one side seam so I could get it on! Tangerine as this year's colour? – I thought that too. This colour was “IN” in 2011 and it's just spilling over to 2012. We must be ahead – like you don't care just love the colour!!! The blouse looks great, it doesn't look too boxy but it's really what you're comfortable with. No point having a blouse you don't like to wear. I wore that blouse in the 60s! The color is perfect for that decade, as well as this era. In the 60s, we wore chemise type dresses as well as some with defined waistlines. Nice sewing. Judy, I first came across a Greist buttonholer on your blog, so technically you are to blame, hehe!! Great idea re the invisible zip! Not only is there a lot of tangerine around at the moment. There also seems to be a lot of spots. Lovely top. Lovely top! I like the boxiness. Also: show us the new toys!! Love it, I was just thinking of you today as I started a new pattern and couldn't figure it out to save my life. You are so talented. I love seeing your work. Everything is so clean and perfect! That's such a nice top. 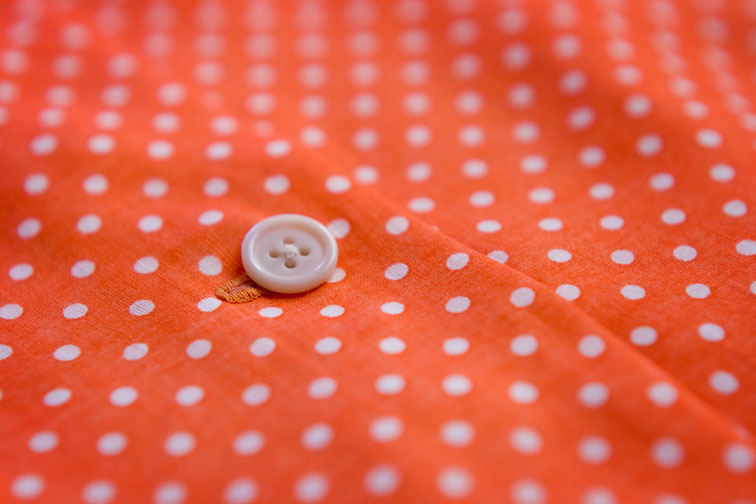 And although I'm not very fond of tangerine (as a garment), I must admit that the polka dot pattern is beautiful! Sherry, this is the cutest top and its a fun colour! I love polka dots in cute tops. I can't wait to see your new toys, I am guessing something to do with buttonholes and maybe a new machine? Such a happy color! The buttons down the back add an elegant touch.